a spiral path around a text. and have it fly around in an 8 pattern or something. I tried creating a spiral path by hand and its just looks bad. Hmmm I'm not sure I understand how the Hot Point would help in this situation. The other thing I was going to try is. Pre replicate the spheres into a spiral and move them and have them rotate with one of the built in behaviours. Problem is I cant figure out how to make a spiral using the "Replicator"
I thought about exporting the object from bryce into Carrara, but I cant export primitives out of Bryce... well I couldnt figure it out. you will never be able to create a PATH in carrara like a spiral that you like to have object follow it! ACtual I am NOT sure what you are trying to do... if you could supply us with an image or a drawing? Are you talking about something like THIS! oh, now all is clear! move the THO to your end location. As mentioned earlier, just offset the hotpoint of each sphere to the radius of the spiral that you need, by pressing the caps lock key and dragging it. Then align all of the sphere hotpoints to the center of your text object. Use the Spin Modifier on each sphere to make them orbit their hotpoints. 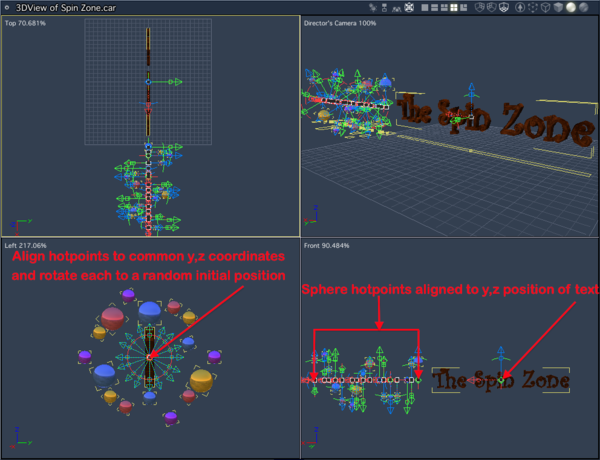 Animate the spheres along the length of the text object. The spin modifier will make them follow a spiral path. DE3AN how did you embed your animation? I though you couldnt do that yet in the forums? Talk about team work :) Thanks to dean and everyone elses teamwork and input, I was able to get the results I wanted. I'm going to attempt to attach the animated gif not sure if it will work or not. So here is how I got my results. 2. Now that I had my Spiral shape, I added the "Spin" modifier to it and had it move from left to right along my text. 3. I made sure the hot point of the text (By default bottom of text), and the hotpoint of the Spiral where exactly centered using the "Motions" settings and as well using the "Left View" so I can make sure they are ligned up nice and pretty. 4. I figured out that 1 complete revolution of the spiral takes 48 Frames, so at 24 Frames per second, it requires 2 seconds of animation to do a complete loop. I need to have this looping perfectly, but the tricky part is getting the right speed from left to right and as well as the cycles per second in the "Spin" modifier settings, otherwise you dont get the look that I've achieved. I'm not sure if its a problem with the GIF loop or that I dont have something right, but it does glitch a little when it has to reloop from the start. Comments, Suggestions would be appreciated. I'll post a link once the final video is done and the music has been added. HOW are you guys embedding these animations and just not a link to them??????? Create a small looping animated GIF file and attach it to the post like any other image. DAZ limits uploaded file size to 9999 KB, so you need to keep it trim. I limited the size of mine by keeping the physical dimensions small and reducing the frame rate to 18 FPS. No audio is possible in this format.